Item # 311764 Stash Points: 395 (?) This is the number of points you get in The Zumiez Stash for purchasing this item. Stash points are redeemable for exclusive rewards only available to Zumiez Stash members. To redeem your points check out the rewards catalog on thestash.zumiez.com. 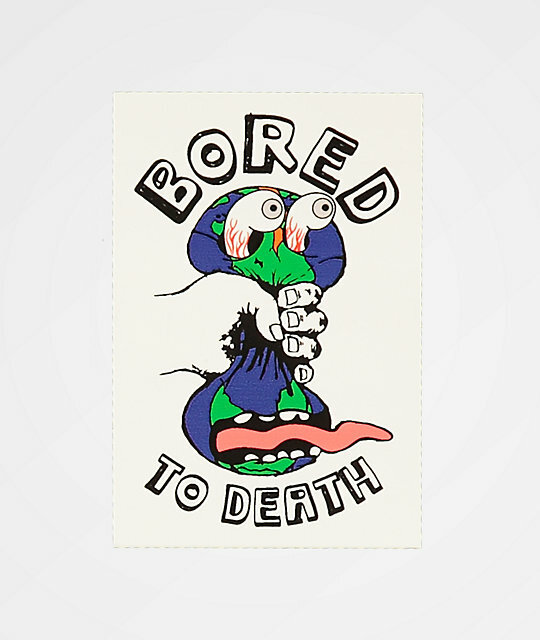 Spice up your boring surface with the Bored To Death Sticker from Teenage. This sticker features an easy peel and stick adhesive backing, a graphic of Planet Earth being squeezed by a human hand, and text that reads "Bored to Death," for a fun accessory that will look good anywhere you stick it. Bored To Death Sticker from Teenage. Graphic of Planet Earth being squeezed by a human hand & text that reads "Bored to Death". 2.5" x 3.5" | 6.5cm x 9cm (approx. ).